Late on May 3, 2018 I suffered a ruptured brain aneurysm which caused a subarachnoid hemorrhage, or sah. An SAH is a type of stroke and only accounts for a very small percentage (1-5%) of all strokes. I was vomiting and couldn't stop. I thought I had food poisoning. Finally, after about 2 hours it slowed down. My husband doesn't drive due to vision issues so I drove us to the ER. Thankfully we made it safely. The ER doctor sent me for an X-ray of my abdomen and a CT scan of my head. The CT scan showed the SAH. They lifelighted me from our local hospital to a bigger hospital better equipped to deal with my situation. By this time it was May 4. Once there they they did more scans and got me into a room in the neuro ICU. Later that day I went down for surgery. They put in coils to treat the ruptured aneurysm. My neurosurgeon did not want to do a craniotomy unless absolutely necessary due to my osteogenesis imperfecta (bones break easier than normal). He was afraid of damage to the skull. The following Thursday (May 10) they did a CTA and found the aneurysm was "misbehaving." Later that day they took me back down to insert more coils and place a stent. I ended up being hospitalized for a total of 10 days. I did have an unruptured aneurysm which was also treated with coils and a stent in the beginning of July. This is a condensed version of my experience just to provide some background. I am blessed because I have very few issues from my experience. I know how much worse it could be and I am thankful I am still here. 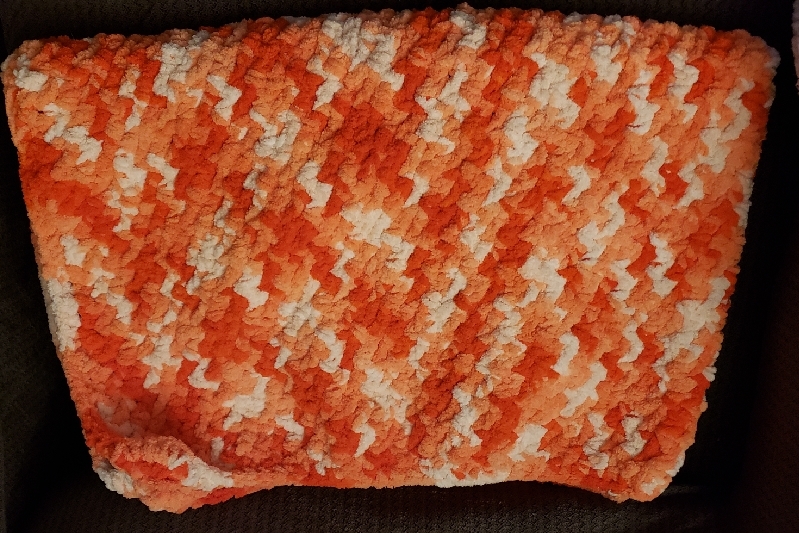 I recently crocheted a blanket and am giving it away in one of my brain aneurysm survivor groups. 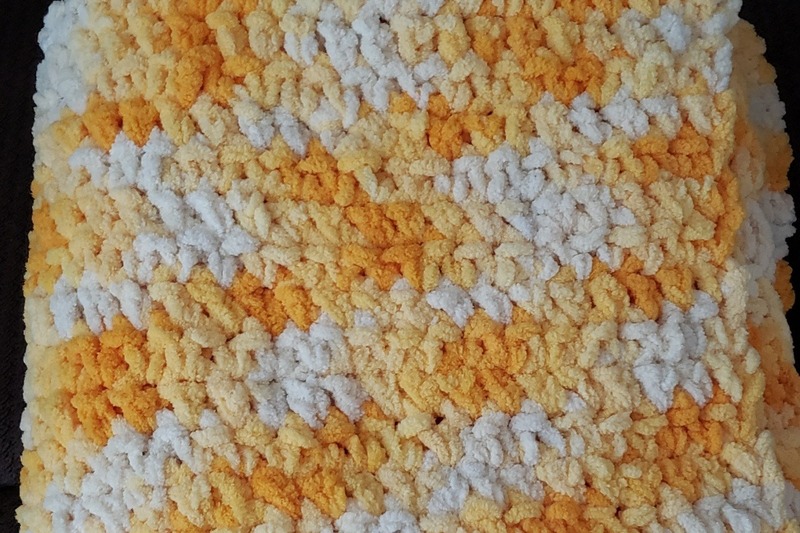 I want to continue this by making more blankets I can give away but the cost of yarn can get expensive. Crocheting blankets is a small thing I can do to bring comfort to someone going through something so terrible. I hope you'll help! The first blanket (the yellow one aka the sunshine blanket) I gave to a fellow survivor was mailed out to it's owner and she received it today! 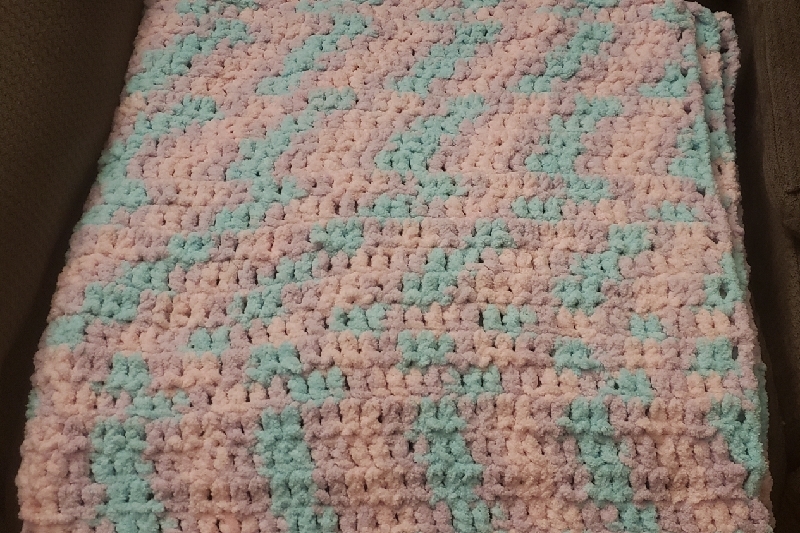 The second blanket (pastel aka the cotton candy blanket) is finished and will be getting shipped out soon. I can't wait to get started on the third one!